The National Indian Brotherhood which is now known as the Assembly of First Nations (AFN) came from Grassroots beginnings of radical Indians but is now a Govt Funded Bureaucratic organization where only INAC Band Chiefs vote to elect a National Chief. It claims to be the national representative of Indigenous peoples across Canada, one that fights for our title & rights. 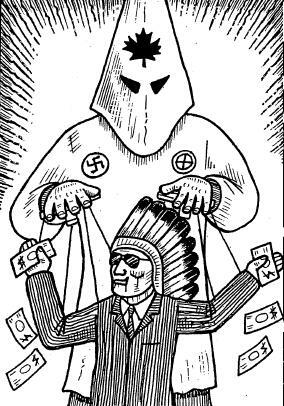 In reality, it is a state-funded organization comprised of Indian Act band council chiefs, who act as neocolonial agents in the interests of government & corporations. Canada’s control over Natives has taken many forms including police & military violence, churches, Residential Schools & Indian Agents. Today chiefs & councilors acting as collaborators have become a vital part of the colonial regime’s ability to control Native peoples. Colonialism always prefers to deal with collaborator chiefs, who can more effectively control their people than can direct government agencies. This is most often done by setting up puppet governments comprised of Native collaborators. These chiefs serve to pacify & confuse Natives appearing to fight for rights & title when in reality they are working right along with the government & corporations. Many are themselves politicians, businessmen and lawyers, who gain wealth, status & power from the colonial system. This involves acting as a legal agent (i.e as a band council or political organization) on behalf of Natives, legalizing the theft & exploitation of our ancestral territories. By helping government impose its policies & strategies on Natives, these types of collaborators aid in the assimilation of their own people. In 1969, many chiefs & councilors opposed abolishing the Indian Act they helped mobilize thousands of Natives into struggle against the ‘White Paper’. Today many claim it is an obstacle to economic development and should be scrapped. Already bands have signed agreements that remove them from the authority of the Indian Act (i.e., self-government & modem-day treaties). What’s changed? Since the 1960s tens of thousands of Natives have passed through colleges & universities. Many were trained in business, administration, or law, skills which were useful for their careers in the Indian Act system as chiefs, councilors, or clerks. During the same time, Indian Agents were phased out and control over local governance was transferred to the band council itself. Today, band councils handle multi-million dollar budgets & are involved in many diverse businesses, including logging, fishing, mining, airlines, garbage clumps, oil & gas, etc. In many cases, they have entered into partnerships with transnational corporations. This development has only’ been possible through their assimilation into the colonial society (which they seek to perpetuate upon their own people). The assimilation of chiefs & councilors is not hard to see: business suits, golf tournaments, fancy hotels, etc are all signs of corporate culture & reflect the real interests of the Aboriginal business elite. In order for them to achieve even greater wealth, status &, power, they promote the assimilation of their own people into the capitalist economic system as slaves for the corporations. Portrayed as some form of sovereignty & nationhood, self-government is the exact opposite. It transforms band councils into municipal governments under provincial &·federal control. Reserve lands become fee simple property that can be bought & sold on the free market. 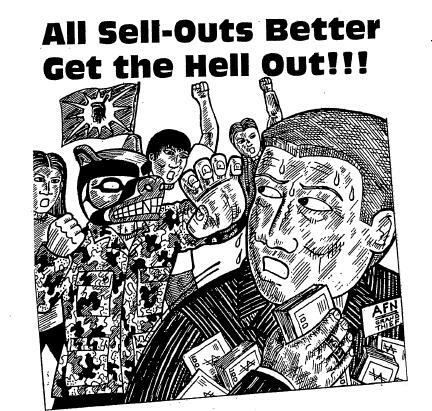 As part of self-government, bands are expected to attain economic independence & the ability to raise their own revenue. This is accomplished by giving them greater legal and economic capacity to sell or lease land, set up partnerships with corporations (i.e., logging, oil & gas, mining), exploit natural resources, impose taxation, etc. All of this involves significant changes in legal codes & political administration. For this reason new laws on First Nations governance, financial accountability, etc. are now being enacted, which are designed to facilitate the expansion of band councils to municipal governments. Sound familiar? It should. It’s the same goal as the 1876 Indian Act and the 1969 White Paper: the legal, political & economic assimilation of Indigenous peoples into Canada. Some bands are already well advanced in their self-government deals, including the Nisga’a, Sechelt, Westbank, Nunavut, James Bay Cree & Inuit, as well as theGwich’in & other Yukon bands. High levels of poverty, unemployment & social dysfunction among Indigenous peoples are used by the state corporations & the Aboriginal business elite to promote ever-greater corporate invasion of our territories under the guise of ‘economic development’. The solution we are told is money. The more the better. But is that really true? In Alberta during the 1970s, large deposits of oil & gas began to be exploited by energy corporations. In some cases, they made deals with Chiefs to drill on reserve lands, providing royalties to bands. By the early 1980s, some bands were receiving millions of dollars annually from the corporations. create new problems. In Hobbema near Edmonton, a rash of suicides made this area known for having the country’s highest suicide rates in the mid-80s. Drugs & alcoholism, division and internal violence increased; by the late 1990s, Hobbema was known for its gang violence, including robberies, drug dealing, assaults & killings. On the other hand, the Lubicon Cree in northern Alberta were, until the 1970s; largely self-sufficient. Some 80-90% ‘of the community were self-reliant, relying largely on hunting, trapping & fishing. This all changed in the ’70s, when energy corporations built roads into the north & began operations. By the mid-80s, the Lubicon were 90% dependent on social assistance. They were unable to rely on traditional food gathering methods as most of the wildlife had been forced out of their hunting areas by industrial logging, oil & gas drilling, road-building, etc. They were also sick & dying, with high rates of disease & suicide. Clearly, economic development is not the solution. Based largely on resource exploitation or some form of industrial activity, economic development always has a negative social & ecological impact. Money can’t solve problems that don’t arise from poverty. The severe social dysfunction affecting our communities-is drug & alcohol abuse, suicide, imprisonment, disease, etc. It may be compounded by poverty, but are not simply the result of a lack of money. Instead they are the direct result of colonialism & genocide. This includes not only the Indian Act system & Residential Schools but also the ongoing dispossession of our ancestral lands & their destruction through economic development. These factors lead to loss of culture & identity, which contributes to social dysfunction & makes Natives vulnerable to assimilation. In the context of colonialism, there are no legitimate representatives of our peoples on any regional, national or international level. The AFN & band councils are illegitimate entities existing only through the Indian Act and state funding, both of which are the result of colonization (a crime under international law). The main function of the AFN is to assist in developing & implementing government policies on a national level. Without groups such as the AFN, Canada would have far greater difficulty organizing its colonial system. Without the band councils it would have far greater trouble maintaining its colonial system. In the last couple of years, sell-out chiefs have signed policing agreements with Canada’s national police force, the Royal Canadian Mounted Police (RCMP). Known as Public Safety Cooperation Protocols, the first was a national deal between the Assembly of First Nations & the RCMP, signed in 2004. The second was a similar deal linked between the RCMP & three BC organizations: the First Nations Summit, the Union of BC Indian Chiefs, & the BC-AFN, in 2005. The agreements are more or less identical & establish a working relationship between the RCMP & ·the organizations that signed on. In the first section it is stated that “The purpose of this Protocol is to establish trusting & reciprocal relationships. With the goal of either preventing situations involving conflict[or] resolving disputes which do develop ‘at the earliest possible opportunity.” This is to be achieved, in part, by establishing “ongoing communications by exchanging information so as to strengthen local, regional, national policing, agencies, & organizations and the establishment of a Joint AFN/RCMP Crisis Response Team…” (quotes from AFN-RCMP 2004 Protocol). In a section on Operational Arrangements, it is stated that “the Parties will establish & maintain a network of contact/resource people who are able to act promptly when a crisis arises. relationships; b)the development of training tools such as orientation manuals & workshops including Aboriginal culture,practices & traditions; c) the sharing of lessons learned best practices of dispute resolutions. the greatest type of crisis that could confront a colonial regime & its security forces. We can see this in the largest deployments of police in recent history: Oka, Gustafsen Lake, Ipperwash, Burnt Church, Six Nations. The basis of arty counter-insurgency campaign is: intelligence gained from informants & collaborators. These protocols formalize the role of Native political organizations & band councils in providing intelligence to police, as well as assisting in developing strategies, tactics & techniques for police repression. Every Indigenous person of this country called CANADA must stop using the word “RESERVE ” as it is an indian act word !